Delphi Diamond's hold true to our values of awareness and transparency by carefully tracking our diamond’s origins. We go beyond the usual standard to guarantee that our diamonds originate from ethical and environmentally responsible sources. Jewellers that offer “conflict free” diamonds are limiting themselves to the Kimberley Process’s definition, which narrowly defines conflict diamonds as diamonds that finance rebel movements against recognized governments. What this definition leaves out is large numbers of diamonds that are tainted by violence, human rights abuses, poverty, and environmental degradation. Delphi Diamonds goes above and beyond the current industry standards to guarantee that our diamonds originate from pure, ethical sources. Our ethically sourced diamonds originate from mines that adhere to strict labour, trade, and environmental standards. All diamonds at Delphi Diamonds have been secured through legitimate sources not involved in funding conflict and in compliance with United Nations Resolutions. We also go beyond conflict free and the Kimberley Process. We choose to comply with the United Nations backed Kimberley Process Certification Scheme and go beyond Conflict Diamonds. We also insist that our suppliers provide us with written guarantees, ensuring they do the same. We guarantee that our Diamonds are Conflict Free based on personal knowledge and written guarantees provided by the suppliers of our Diamonds. 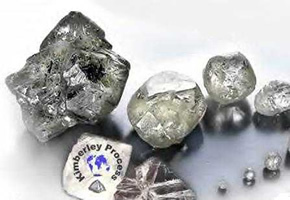 For Diamonds mined prior to the formal operation of the Kimberley Process on 1st January 2003, our suppliers warrant they have not knowingly supplied us with Conflict Diamonds and have taken reasonable precautionary measures to ensure this. Conflict diamonds are diamonds illegally traded to fund conflict in war-torn areas, particularly in central and western Africa. The United Nations (UN) defines conflict diamonds as "diamonds that originate from areas controlled by forces or factions opposed to legitimate and internationally recognized governments, and are used to fund military action in opposition to those governments, or in contravention of the decisions of the Security Council." Conflict diamonds captured the world's attention during the extremely brutal conflict in Sierra Leone in the late1990s. During this time, it is estimated that conflict diamonds represented approximately 4% of the world's diamond production. Illicit rough diamonds have also been used by rebels to fund conflicts in Angola, Liberia, Ivory Coast, the Democratic Republic of Congo and the Republic of Congo. Today, the flow of conflict diamonds has been reduced to considerably less than 1%. - There are three diamond producing countries that account for this small percentage. Firstly, the Republic of Congo has been suspended from participation in the Kimberley Process owing to areas of non-compliance. Secondly, Liberia and the Ivory Coast are under United Nations Security Council Resolutions to prohibit the extraction and trading of diamonds. Despite both the Republic of Congo and Liberia benefiting from internationally recognized peace agreements, diamonds from these countries may be referred to as "conflict diamonds". While diamonds have been used to fund conflict, the problem is not the diamonds themselves but the rebels who exploit diamonds (along with other natural resources) to achieve their illicit goals. The vast majority of diamonds come from countries at peace. These countries have been able to invest the revenue from diamonds into the development of infrastructure, schools and hospitals for the good of the communities in which diamonds are found. These countries include Australia, Botswana, Canada, Namibia, Russia, South Africa and Tanzania. Consumers can aid in the effort to ensure that diamonds do not fund conflict. Only buy from a reputable jeweller. 1. How can I be sure that none of your jewellery contains conflict diamonds? 2. Do you know where the diamonds you sell come from? 3. Can I see a copy of your company’s policy on conflict diamonds? Every dealer should be prepared to provide you with the below written statement or words to that effect. Contact us anytime to speak with a qualified Delphi Diamonds professional about any questions you may have or to arrange your appointment.